Happy Anniversary, Flies Over Nebraska! Yesterday, Flies Over Nebraska celebrated it’s first anniversary… Strange to think I have been doing this for an entire year! I don’t have much time for a long post today… I am in the middle of my last class for my graduate degree, so I don’t have a lot of time for anything… even fishing. And here’s to the next year of casting Flies Over Nebraska! …Is what Little E said when she saw this picture. Even a 2 year old knows to mock an angler that catches this small of a fish. But it’s better than getting skunked… right? As part of my 2013 fishing goals, I decided to try out a new lake. As I was running errands with Little E on Sunday morning, I noticed how every boat in Lincoln seemed to be headed out of town. And not just the power boats… I saw enough Lunds and Bass Trackers on their way out of town to make me realize that most of the common fishing lakes were going to be packed. I mean it was Father’s day… what father wouldn’t want to spend it on the lake? So I decided to head out to a smaller lake that I knew about, but never hear much about on the fishing forums. This particular lake resides clear off the beaten path, down several miles of country roads. A perfect place to try to find some peace and quiet by myself. I am going to decline to name this lake… sorry. I am going to turn into a sobby fisherman… I don’t want this to show up on any search engines. When I finally found the lake, I was happy with what I found. A quiet, small lake. No wind. And only a couple other people fishing. I scouted out the bank for a few minutes and found a good spot to launch my float tube. After having to come back in to add more air… I was off and fishing. But the fishing wasn’t off and running at first. I spent the first couple hours without many bites. One small bluegill, and one nice fish that threw a hook and got away. Up comes a 9.5 inch bluegill. Just a half inch shy of a Master Angler award. But a great catch that totally made the trip. I kept fishing down the bank, and around a family that was doing some father’s day fishing on a rock jetty. After they poked a little fun at my float tube (no offense taken! ), and explained what it was to their children, I had the strike of a lifetime! This fish doubled over my rod, line flew through my hand, and the fish went on a run away from me! I “reeled it up”, suggested which direction I wanted the fish to go, and back peddled to open deep water to avoid a snag up. A big fat 19 inch largemouth bass! My personal best! This fish even had another line hanging out of its mouth. Judging by the shape of the hook and swivel, they had not been there very long. Apparently, someone else recently hooked into this fish… but they where not able to bring it to hand. Makes the victory that much sweater, knowing that I did what someone else could not! Another slam on the line! Only this fish shot out of the water and went airborne right after I hooked up… and I got a look at another nice bass! A nice 17 inch bass to top off the day! Two trophy fish; one right after another. This experience made the two bite-less hours to start off the day total worth it. I guess it just goes to show that a little bit of patience can go a long ways. After I released this fish, I only got a couple more casts in… a stormy looking southwestern sky chased me off the lake. But the best part of my day??? Stop back soon to see! Guess who is in it… check out page 3! 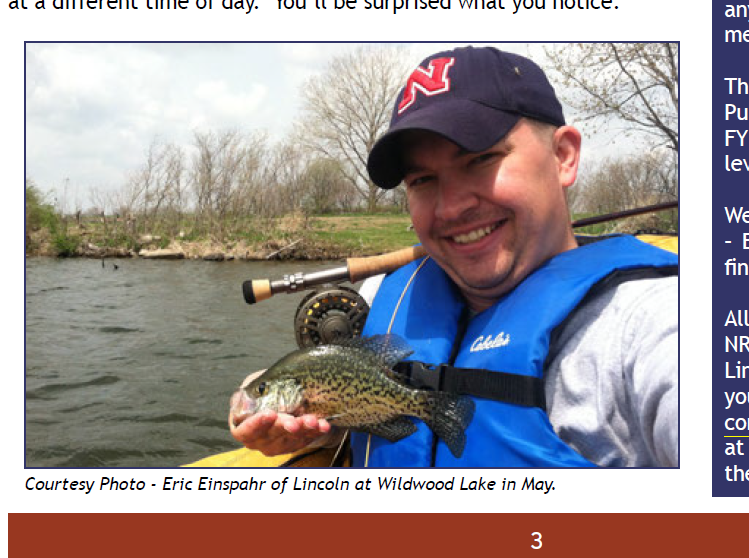 Okay, not the biggest of publications, but still cool none the less… And a great organization providing fishing opportunities in my beloved Cornhusker state.